When choosing a GUI, one of the most fundamental questions is: what can it do for you? 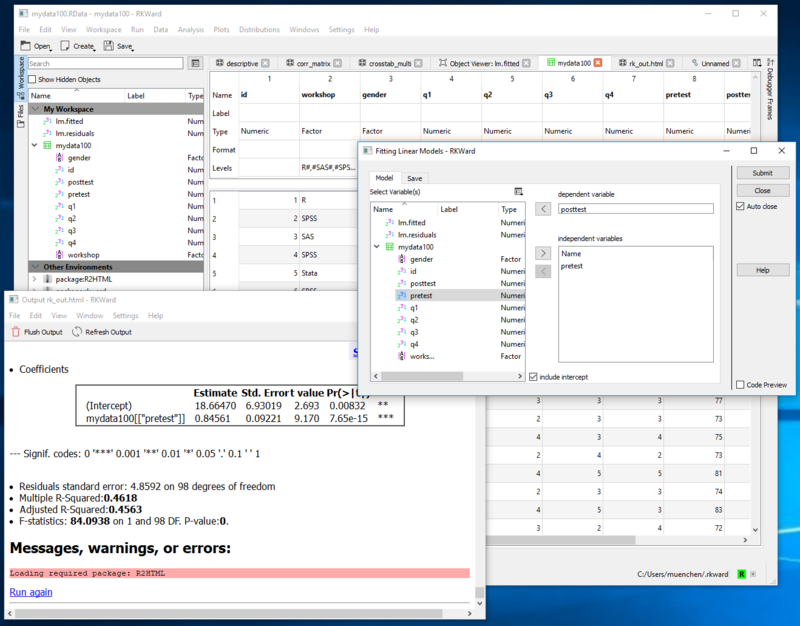 What the initial software installation of each GUI gets you is covered in the Graphics, Analysis, and Modeling section of this series of articles. Regardless of what comes built-in, it’s good to know how active the development community is. They contribute “plug-ins" which add new menus and dialog boxes to the GUI. This level of activity ranges from very low (RKWard, BlueSky, Deducer) through moderate (jamovi) to very active (R Commander). RKWard add-on modules are part of standard R packages and are distributed on CRAN. Their package descriptions include a field labeled, “enhances: rkward". You can sort packages by that field in RKWard’s package installation dialog where they are displayed with the RKWard icon. Ggplot2 doesn’t work with RKward. If you run install.packages(“rlang”) then ggplot2 will load and you can create graphs using it. This type of message pops up all too often in R. Any package that it says is missing, you just install, even though it often should have been installed automatically with the main package you’re trying to use. It should work fine with the latest release of R.